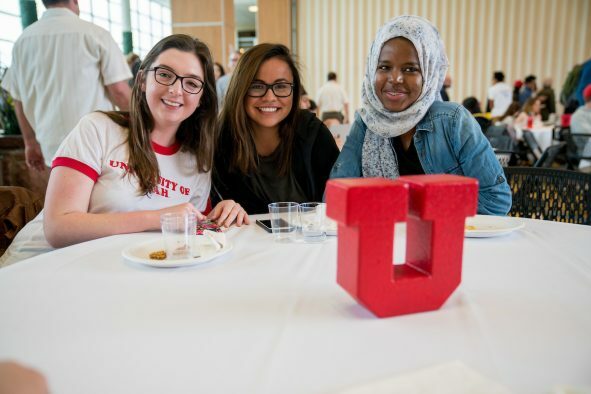 University of Utah senior Hodan Abdi came to Utah with her family five years ago from a refugee camp in Ethiopia. She will graduate with a bachelor’s degree in chemistry and an emphasis in biology this year, along with 8,568 other U students who will also celebrate achieving this milestone. 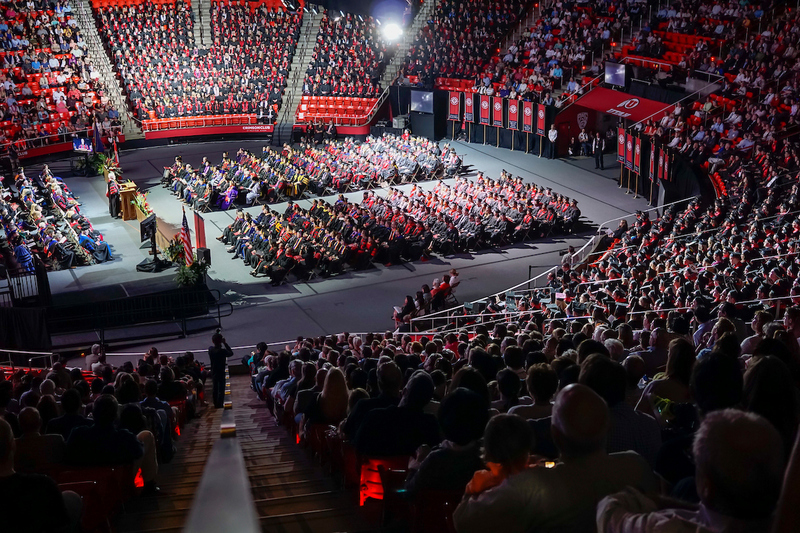 The 149th general commencement ceremony will be held Thursday, May 3, 2018, 6:30 p.m., in the Jon M. Huntsman Center, and most college convocations will happen the next day. Commencement student speaker Hodan Abdi (far right) attended Pizza with the President on April 10, 2018. Abdi transferred to the U after studying at Salt Lake Community College for two years and will attend medical school this fall. Originally from Somalia, Abdi’s family fled in 2008. As a high school student in a refugee camp, she didn’t have time to study during the day as she took care of her younger siblings, cooked and cleaned. With no electricity or technology, Abdi often woke up at 2 a.m. to study by candlelight. Abdi explained that there were many challenges surrounding women and education. Almost 80 percent of her high school classmates were male, with most women getting married and having children at a young age instead. Once she finishes medical school and pays off her student loans, Abdi wants to start her own clinic and go back to work in a refugee camp to help provide much-needed medical care and distribute information about preventative measures. General commencement is a campus-wide celebration open to all students, their families and the public and is an opportunity for the institution to celebrate the graduating class and recognize student achievements. Each college holds a convocation ceremony, where candidates for graduation are acknowledged individually and where college-specific awards are presented. College convocation schedules can be found here. Campus parking lots may be used at no charge during commencement and convocation ceremonies. As campus parking is limited, visitors are encouraged to use the free U shuttle service to travel between commencement events. Shuttles run throughout campus and are scheduled every 10-15 minutes. The U campus is also a TRAX free fare zone on May 3 and 4. The commencement ceremony is free and open to the public. 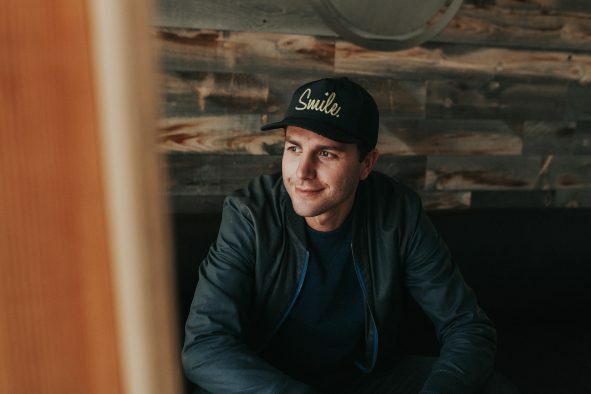 As is standard for events occurring in the Huntsman Center, bag searches will be conducted for the safety and security of the graduates and patrons. More details are available here. 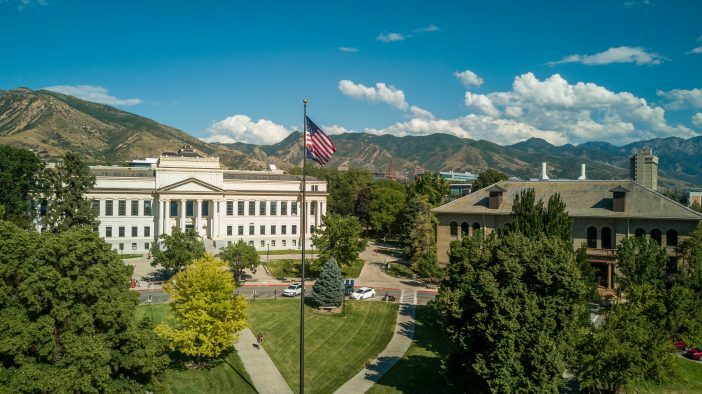 Those unable to attend commencement will be able to watch the live stream on the university’s website, utah.edu/live.